Window World is one of the very best home improvement brands in this country, and for good reason. If there’s anything that is needed in regards to windows, Window World is a tough place to beat. It is accredited by the Better Business Bureau, Good Housekeeping, the Environmental Protection Agency and Energy Star. 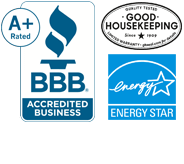 Between being Energy Star certified and having the Good Housekeeping Seal of Approval, Window World is as trusted by important organizations as it is by its customers. What does each of those certifications mean though? The Good Housekeeping Seal is something many businesses strive for, and Window World has gotten it for the past eight years. The Good Housekeeping Institute looks at several qualities in products, such as safety, performance, durability and design. Through those tests, Window World was named as a superior product. That comes with the Good Housekeeping seal, which offers a two-year warranty in addition to Window World’s lifetime warranty. The Better Business Bureau has accredited Window World TX since 2009, and has given them an A+ rating. That rating is scored on several criteria, including transparent business practices, compliant levels, and how they advertise. The BBB obviously knows what it’s talking about. Window World is also an Environmental Protection Agency lead-safe certified company. According to the EPA’s website, any company that is “is paid to perform work that disturbs lead paint or conducts lead dust sampling in housing or child-occupied facilities built before 1978 must be certified.” Window World does, so obviously getting lead-safe certified is important. Being Energy Star certified means that the consumer will “save energy and money without any sacrifices in performance” for that product, according to its website. Window World is Energy Star certified, which is a process that not every company can manage. First, a company is rated on a scale of one to 100, and if they reach 75 or higher they can apply for certification. Then a professional engineer or registered architect must confirm that the information is correct. It is a process but one that Window World went through because our customers need to know we can always be trusted to be quality. Are you interested in working with Window World of Texas? Contact your local San Antonio or Corpus Christi offices to see how we can come help you!